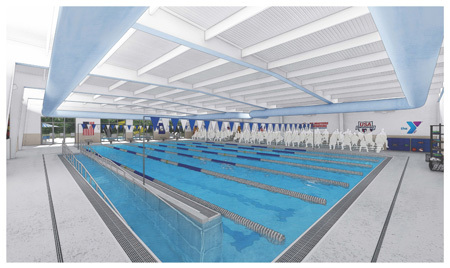 Rendering of the $3.1-million aquatic center at the Northern Neck Family YMCA, Virginia. A new, $3.1-million aquatic center will be constructed at the Northern Neck Family YMCA in Virginia next year. A volunteer campaign raised funds for the 743-m² (8000-sf) indoor center and 464-m² (5000-sf) outdoor family pool. “Residents of the Northern Neck are surrounded by rivers and waterways, so it is critically important we have an appropriate venue for children and families to learn to be safe in and around the water,” said Paul Sciacchitano, who led the volunteer campaign for the project. perimeter gutter design for a cleaner pool and less turbulence for competitive swimming. Guernsey Tingle Architects of Williamsburg will serve as the design firm for the entire aquatic center complex, and Connemara Corporation of the Northern Neck is the general contractor (GC). The project is expected to be complete by August 2019.